Yes! Everyone at Acadia and in the Wolfville community are welcome to eat in Wheelock Dining Hall. You can purchase a dining plan or pay the entry price. Please visit http://financial-services.acadiau.ca/students-4959/acadia-campus-card.html to purchase online. For more information on purchasing please contact Student Accounts (902) 585-1297 or student.accounts@acadiau.ca. Plans based per meal are for use at Wheelock Dining Hall while Swipe & Save Dollars can be used at all Chartwells food service locations on campus. All taxable meal plans can be carried forward from semester to semester but expire when residences close in April. Please check with our food service office or Student Accounts for complete details. Residential dining plans are only refundable if you withdraw from residence or from the university. The cost will be pro-rated based on the number of days in residence from move-in day until the date of withdrawal noted on the Academic Withdrawal Form. Some exceptions do apply. Please check with Residence Life for full details. Taxable Dining Plans are only refundable if you withdraw from the university and an administration fee of $40 is applied. Any bonus dollars, complimentary incentives and guest passes are not refundable. Your plan is valid September through April and does not transfer to the following year. Sorry, you are not allowed to take food out of Wheelock Dining Hall. These plans are for food that is consumed in the dining room only. The security of a card remains the cardholder’s responsibility. Cards should be treated like a credit or debit card. If a card is lost or stolen the cardholder is responsible for all charges made to that card until the card is reported lost or stolen. Report your lost or stolen card to Security in the Students’ Union Building so the missing card will be deactivated and a new one issued. 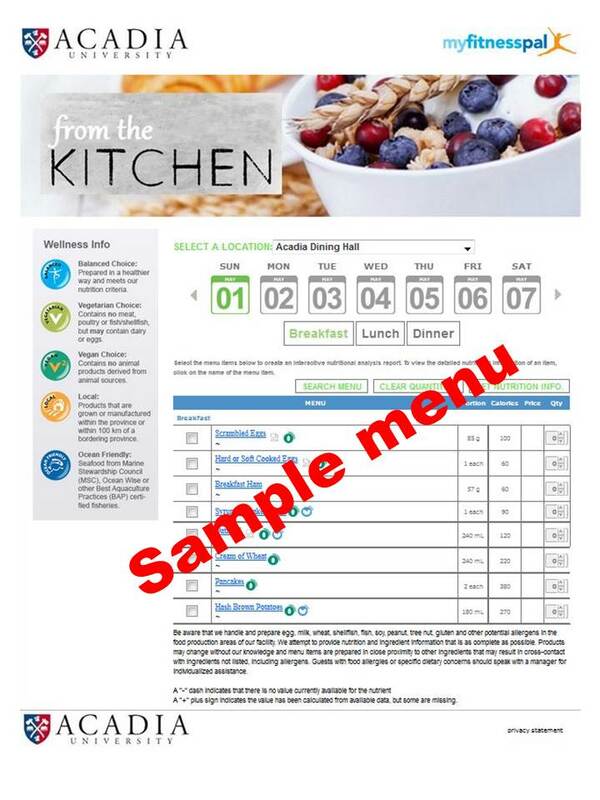 The Healthy 80, Convenient 60, 35 Meal Deal, and 10 Meal Sampler are based on swipes of the card so if you would like to use a swipe on a friend we would welcome the opportunity to serve them. The 5 and 7 Day plans are tax exempt therefore can only be used by the subscriber. Use your Swipe & Save Dollars or Dining Dollars (attached to some 7 day plans) to pay for your guest's meal. HOW DO INDIVIDUALS WITH ALLERGIES OR DIETARY NEEDS IDENTIFY SAFE FOODS? Please reach out to one of our staff and let us know what your allergies or dietary needs are. We are happy to help you and ensure that you are finding safe and healthy foods! If you are a new student coming to Acadia or have not yet filled out our Allergy Form please download it and send it to Becky Kennedy, Residential Dining Manager, at becky.kennedy@acadiau.ca. If you have any further questions or require assistance you may contact Becky at (902) 542-3049.